You may have noticed that there has been a metal llama in Fortnite for a good while, but what about the stone pig and wooden rabbit? Finding them all is one of Fortnite’s challenges in week 6 and we have the locations for all three. This guide will have a map showing all of the locations for the wooden rabbit, the stone pig, and the metal llama in Fortnite’s map. You need to get quite close to them as well, so we’ll also provide detailed instructions for where you need to go for each one. Above is the map showing the location of where that knife is pointing to. You can just descend right on top of the location and nab that all-important Battle Star, but it’s also good to take in the surroundings for a short time – that is unless someone is shooting at you in which case eliminate them before basking in the majesty of the sculptures. But of course circles on a map only tell half the story. Here are the five locations in more detail and the best ways to get to them quickly. I recommend that you play the Team Rumble LTM for this challenge as it gives you a bit more leeway in case someone kills you before you get to each location. Due north of Snobby Shores at Grid Reference A4, the wooden rabbit is perched on the cliff overlooking the western part of the ocean. There’s a small slope that you can use to get up there if you didn’t land here from the Battle Bus, just try not to go off the edge. The Stone Pig is also by the coast, but this time it’s on the southern tip. Head to Lucky Landing and climb the cliff to the east of it. You’ll see the rather crudely generated stone pig facing the tower. You’re probably very familiar with this metal beast, but the llama is situated just to the north and west of Junk Junction. It’s also facing the cliff edge and is the furthest to the north and west. Given how far away it is, I highly recommend landing here from the start, so you’re not at risk of dying to the storm. This concludes our animal location guide, but there’s plenty more challenges to complete in Season 8. 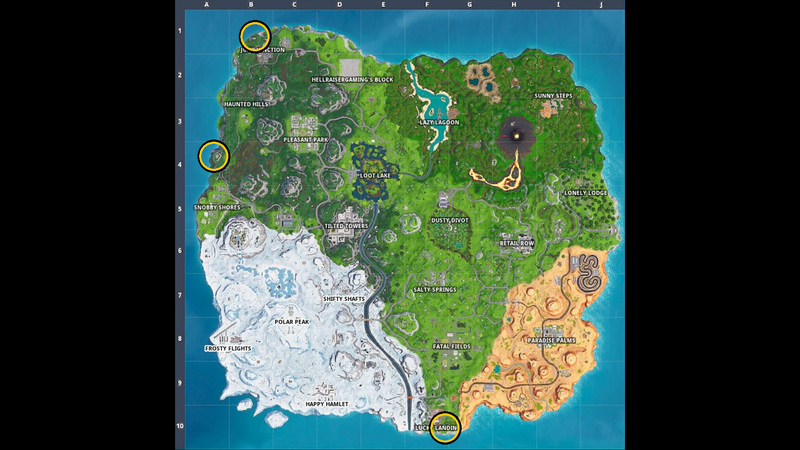 You can find out where the highest points in the map are in our Fortnite highest elevation locations guide, or what the knife in the treasure map loading screen is pointing to in our Fortnite Treasure Map loading screen knife location guide.